The human body serves as the physiological and philosophical lens through which humans understand and structure their world. In The Memory of Bones: Body, Being and Experience among the Classic Maya, Stephen Houston, David Stuart and Karl Taube stress the importance of the human body in cosmology: “At once physical entity and cognized image, the body endlessly generates metaphors for ordering thoughts and actions about everything from society to morality, buildings to geography, often linking body space with cosmic and social space”. Oftentimes, cultures envision the body serving as a microcosm, a small-scale encapsulation, of the universe. Because of humans’ intimate and innate knowledge of the body, its form, articulation and coordination routinely serve as models for ordering and organizing the social world. 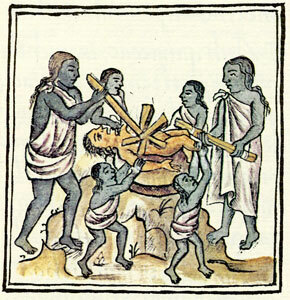 In Mesoamerica, creation stories describe the origin of human life and provide models for its cosmological continuation through human sacrifice. Creation myths link the body with social understandings of the universe through stories that describe the dismemberment of gods, humans’ creation from the broken bones of giants, and the divine autosacrifice that initiated human life. In the Mexica-Aztec and modern Náhua worldviews, the human body and the physical world are analogous, and older and modern Náhuatl terms, concepts and metaphors reflect the ways in which the human body corresponds to the physical world. 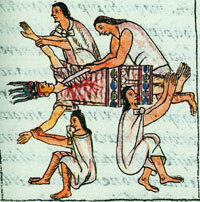 Náhuatl morphology and metaphors shape the ways the Mexica-Aztec and modern Nahuas think about the body and the world. Interestingly, the body orders the Mesoamerican world in fundamental ways, too. Linguistically speaking, Náhuatl morphology regulates the body in specific ways. 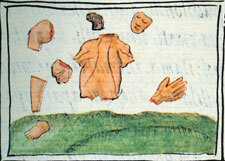 In Náhuatl, body parts (eyes, noses, arms and legs) are inherently possessed. Whereas English speakers refer to “the eye” or “the nose” and Spanish speakers “el ojo” or “la nariz,” modern Náhuatl speakers talk about “noixteyotl” (my eye) and “noyacatzotl” (my nose). In Náhuatl, body parts never appear without a possessive prefix (my, your, his/her, our, your, their), because their status as parts of a whole precludes them from being conceived of as independent entities. In thought and speech, individual parts are inseparable from the body. In addition to naming physiological components of the body, Náhuatl body terminology metaphorically extends to other essential components of the physical world. 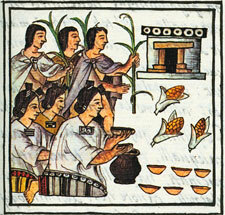 For example, the Mexica-Aztec call both human flesh and maize tonacayo (our flesh). This term for maize derives from tona (solar heat) and reveals that the Mexica-Aztecs understood maize as a metaphoric abstraction of the sun’s warmth. 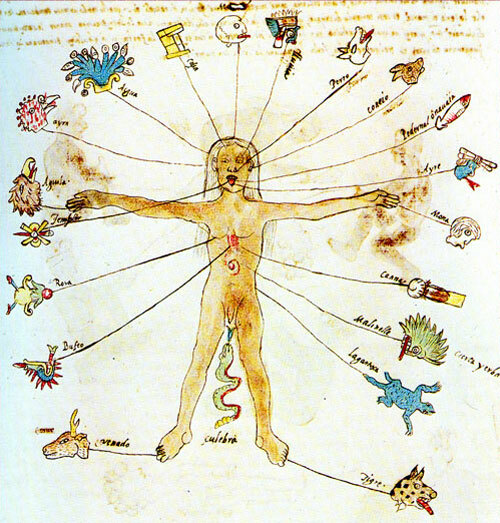 In The Human Body and Ideology: Concepts of the Ancient Nahuas, Alfredo López Austin explains, “In Náhuatl, the name most commonly applied to the human body, considered as a whole, uses only the predominant element: ‘the whole of our flesh’ ( tonacayo). This same term is applied to the fruits of the earth, especially to the most important one, corn, thus forming a metaphoric tie between man’s corporeal being and the food to which he owed his existence”. In Mexica-Aztec cosmology, altepemeh (watery mountains or sustenance mountains) both house chicomoztoc, the seven caves of origin, and store corn and/or water, two of the fundamental sources of tonacayotl (our sustenance). It may be that as sources of life and providers of sustenance altepemeh and tonacayo (especially female bodies) are also analogous. While Náhuatl morphology regulates or restricts the body in some ways, the body also provides a basis for organizing the world. For example, both the Mexica-Aztec and the Maya used a vigesimal or base-twenty counting system that probably originated from the total number of the body’s phylanges (ten fingers and ten toes). 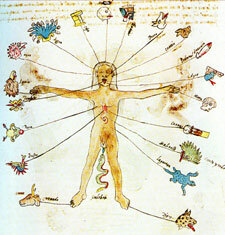 In Náhuatl, the numbers one through twenty reflect a parts-and-whole logic that applies to the entire body. For example, macuilli, the number five, completes the count of one hand and means “what the hand takes.” Counting up from five, numbers six through nine mean “the incomplete” plus one, two, three and four. López Austin explains, “Ten returns etymologically to hands, as extremities of the upper part of the body ( matlactli), to distinguish the first two series of five numbers from the following two, which all together made ‘a count’: twenty”. 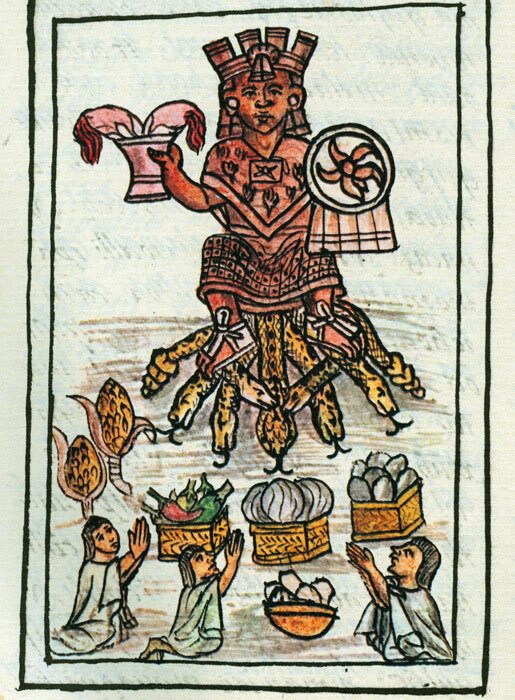 In addition to the reciprocal influences of the body on Náhuatl and Náhuatl on the body, the Mexica-Aztec perceive the body as having specific social and ritual significance and significations. Much like Westerners attribute powers of reason to the mind and emotions to the heart, the Mexica-Aztec also associate feelings and thoughts with corporeal areas and organs. They relate hearing to memory, recollection, knowledge and reason; the verb caqui means both “to hear” and “to understand things.” The head and face reflect reactions, emotions and nobility; “in the face as revealed the reflection of vitality heightened by honor, and signs of aging were viewed on a scale in which the passage of time was directly correlated to experience and, with it, a man’s value among his fellowmen” (López Austin). 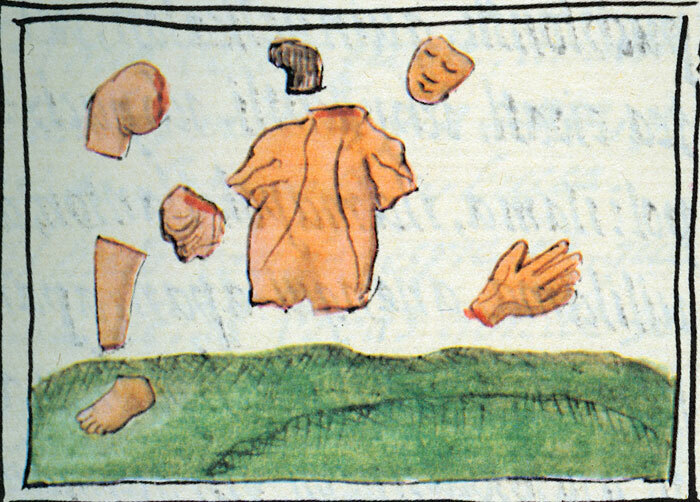 Texts like The General History of the Things of New Spain record the Mexica-Aztec’s keen observation of the human body, its attributes and their significance. 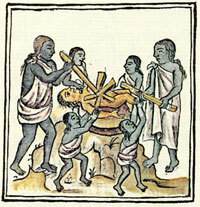 Descriptions like that of the perfect sacrificial victim in General History Book 2: The Ceremonies reflect the scrutiny with which the Mexica-Aztec contemplate the body: “He was like something smoothed, like a tomato, like a pebble, as if sculptured in wood . . . He was not buck-toothed . . . he was not fang-toothed . . . he was not rotten-toothed; his teeth were [like] seashells; they lay well; they lay in order. . .”. The list of the perfect sacrificial victim’s attributes spans two pages before concluding, “For him who was thus, who had no flaw, who had no defects, who had no blemish . . .”. 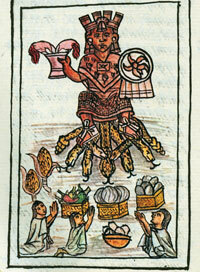 This passage reflects the importance of the body and its appearance in Mexica-Aztec rituals. Furthermore, it demonstrates that the Mexica-Aztec methodically observed the human body and compared its forms to other naturally occurring formations that they esteemed. Náhuatl terminology for and descriptions of the body reflect the ways in which the Mexica-Aztec understood their bodies and their relation to the social and cosmic worlds. For the Mexica-Aztec, the human body enabled both perception of the physical world and conceptions of its cosmological import. • Houston, Stephen, David Stuart, and Karl Taube. The Memory of Bones: Body, Being, and Experience among the Classic Maya, Joe R. and Teresa Lozano Long Series in Latin American and Latino Art and Culture. Austin: University of Texas Press, 2006. • López Austin, Alfredo. The Human Body and Ideology: Concepts of the Ancient Nahuas. Translated by Thelma Ortiz de Montellano and Bernard Ortiz de Montellano. Salt Lake City: University of Utah Press, 1988. • Sahagún, Bernardino de. Book 2: The Ceremonies. Translated by Arthur J. O. Anderson and Charles E. Dibble. 2nd ed. 12 vols. Vol. 3, General History of the Things of New Spain. Santa Fe, NM: The School of American Research and the University of Utah, 1981. 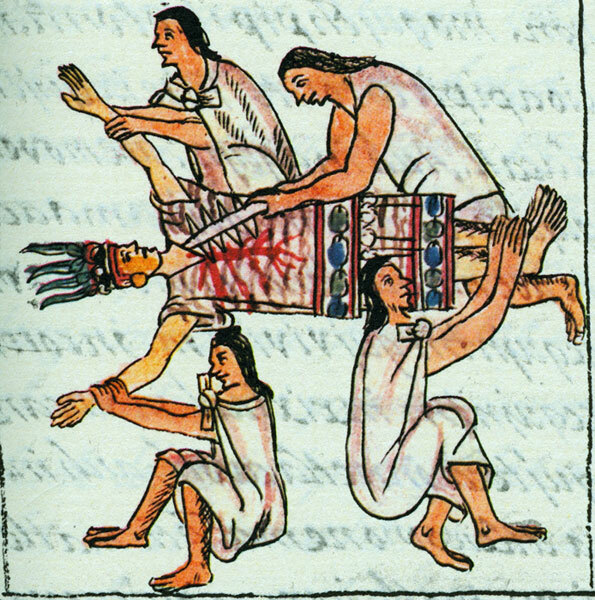 • Images from the Florentine Codex (original in the Biblioteca Medicea Laurenziana, Florence) scanned from our own copy of the Club Internacional del Libro 3-volume facsimile edition, Madrid, 1994. This site was excellente to my school work. Thank you. First of all they were NOT AZTECS they were MEXICA from AZTLAN. This is common we should start CALLING them MEXICA that’s THEIR REAL NAME. BUT YOU HAVE VERY GOOD INFO. Mexicolore replies: When we go to schools we explain these points, Art; we have to use the name Aztecs in the UK because ‘Mexica’ means nothing to teachers and pupils here.